Would you believe that 88% of continuity programs average retention is less than 2-years? This isn’t a statistic you hear from the gurus selling courses on how to create continuity programs. The whole point of building these subscription and coaching continuity programs is to build a steady income, revenue you can count on and budget for each month. If members are churning out as fast as you can recruit them, it doesn’t produce the security and steady income you were promised. I’m particularly shocked about the results of this survey as I come from the association world. Within associations, what do you think the average member retention is? According to the American Society of Association Executives the average for all associations within the United States is just a tick over 5 years. And, associations strive to get this number to 7 years with the best 25% achieving this number. All but my newest association clients are well over a 10-year average retention rate. I’m able to achieve these remarkable rates because of an important difference in the way I approach membership marketing. Most association marketers make the same mistake as my for-profit continuity program clients. I hear the same question: “What ‘pain of disconnect’ benefits can I offer that will lock in our members.” That question completely misses the point of membership marketing. Membership marketers focus too much attention on return on investment. Years ago I had a chamber of commerce client who invested hundreds of thousands of dollars to build a computer system that tracked every benefit an individual member utilized. If a chamber member sent someone to a chamber event, the computer recorded the dollar amount that member saved compared to the non-member registration rate to attend that event. If that member used an endorsed vendor that offered a discount to members or chamber insurance program, the computer recorded the savings. All of it was meant to illustrate the terrific return on investment members received from chamber membership. The result? Membership continued to plummet. 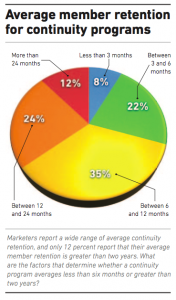 Membership marketing is only 20% about return on investment. It’s about relationship. There’s no place that’s more evident than the numbers for new continuity member retention. Did you know that fewer than half of all continuity programs retain 75% of their members for 3-months? This means a huge chuck is leaving as fast as they get them signed-up. What a hard way to build a business! Similarly I was just speaking with an association client that has a strong “golden handcuff” insurance benefit. It’s so strong that they regularly get members who sign-up to buy insurance and join the association as an afterthought. The association’s frustration is that they have a hard time retaining those members in the association if they drop their insurance coverage. As my 16-year old son Robert William would say, “Duh.” If you want to build a membership you have to stop treating them like customers and start treating them like members. What to customers want? They want to trade money for stuff. What to members want? Members want an advocate, a cheerleader and most of all, they want a relationship. Yes, there are newsletters, yes, there is information and yes, there is stuff. Yet, none of that is what the transaction is about. It’s really about having a voice, being recognized and feeling important. Being part of something where a group victory is seen as a personal victory. Consider for a moment the NFL. Pick your favorite NFL team or if you hate the NFL think about your favorite non-NFL sports team. How do you feel when they win? Why? Do you get money when they win? Is there a return on investment? Why does their victory have any impact on your life? Because you identify with the stories, the group and you see the group’s victory as a victory for you. These sports teams exist because there is a demand. These teams are the generic expression while Ferguson is a socio-economic expression. And, for your niche, this is where you come in. What is your target market? Who do you represent? What are their frustrations? Where do they believe the system doesn’t work for them? How can you give them a voice? How do you recognize them for what they achieve within their community? As a membership marketer, this transcends return on investment. It turns your continuity program into a movement. And, it turns your members into lifetime evangelists for you. I’m sharing the same member retention secrets I’ve been implementing with my private clients over the last 6-months to tremendous results. It’s a brief document titled, Member Retention: Why most membership programs fail and how to boost your member retention from weeks to years. If you’d like to keep more of the members that you are losing each month but don’t know where to start, this can give you several quick-wins that’ll immediately improve retention. Just follow the steps I outlined and you’ll be light-years ahead of anyone else. If you’ve been working on retention for years and you think you have it down pretty well, this will give you a scoreboard to judge your program’s performance as well as a few ideas you may have not yet thought of that can help you retain more of the members you recruit. Yes, Robert, send me Member Retention right now!